We arrive in the Catlins for three days exploring the coastline. Beginning of May, the weather starts to get cooler. We won't be long in the wilderness. Or so we thought! Ten days later, we leave the region, promising we'll come back one day. Situated off the beaten track in the far south of New Zealand's South Island, the Catlins encompass the area between Kaka Point and Fortrose. The region is broad and wild, with lush forests, rugged coastlines, hidden waterfalls and vertiginous caves. And such a stunning untamed nature attracts an extraordinary wildlife. It's a true haven for travelers. On top of the relaxed lifestyle that just makes you want to settle down here and stay forever, there is so much to explore you could easily stay a month -we only left because of the weather, otherwise we'd probably still be in the Catlins. Discover 10 things that made the Catlins one of our favorite places in New Zealand. After a week in the dynamic city of Dunedin, we hit the road destination the wilderness. As usual in New Zealand, a few kilometers bring us from the busy urban life to a complete different world. We drive along a dramatic coastline, stopping every mile to enjoy spectacular views. It will take us almost an entire day to do 90 km, the landscape being so scenic we can't help but stop. During our 6 months road trip in New Zealand, we mostly used HelpX to find a place to stay. It consists on working 4 hours a day for a family in exchange for food + bed (or 2 hours work just for the bed). We loved the concept, as it allowed us to meet the locals and avoid killing our budget with backpackers rooms (they're very expensive in NZ!). During our journey, we had some notably excellent experiences with HelpX. Our stay in the Catlins was one of them. We stayed in Curio Bay, where our work consisted on taking care of a small backpacker (check-in, laundries and beds) + doing some cooking in exchange of a bed and... free surf lessons everyday! After a quick training on the beach, we jump in the water -to soon realize we're in the southern part of the Southern hemisphere, meaning next thing South is... the ANTARCTIC. It's freezing! Luckily, our thick wetsuits work its magic, so after a few minutes in the water, we're ok. Here we are in the ocean with Nick, our instructor. Paddle, paddle, paddle, go, go, go, GO!! Then he leaves us play in the waves alone. Not really alone, actually. There are the waves, the gorgeous sunset on the hills and... is that a...? A dolphin!? There's a DOLPHIN! Here! Here! Here! And when I say here, I mean right here, two meters from us, surfing in the waves (much better than us, by the way). Then it's not one but a whole pod of dolphins! Next, a baby sea lion decides to play with us. It's MAGIC, yet so impressive. We'll share a couple of waves with them before it gets dark, then head back home, floating on clouds. They aren't just any dolphins, they're one of the rarest and the smallest marine dolphin species on Earth. They grow no more than 1.5 m in length -which is still quite big when they're swimming right next to you- and they're aaawesome surfers. The Hector Dolphins are endangered, nowadays they can only be found in New Zealand waters. So you can consider yourself pretty lucky swimming with them! As mentioned before, the best way to enjoy the Catlins is... a ROAD TRIP, BABY (it works for the whole country)! So make sure to prepare a good playlist and hit the Southern Scenic Route. This road leads from Queenstown to Dunedin, with a full length stretching about 650kms of beauty. At its name suggests, it is scenic. You'll discover some perfect picnic spots, from massive deserted beaches, pristine lakes, stunning mountains to lush rainforest. Enjoy the remoteness and take the time to stop wherever you want -for a snack break, a hike or a nap by the water. A pathway leads to a hidden viewing platform beside Tokata Lighthouse that offers the most DRAMATIC view of 'the Nuggets' -these wave-eroded rocks likened to the shape of gold nuggets- and the Ocean. Once again, we are alone, with the view for ourselves. The wind whistles, waves crash on the rocks, seals play in the water... Spectacular. After 5 months in New Zealand, I was DYING to see some penguins. Curio Bay is known for its legendary fossilized forest by the beach, dating back to the Jurassic period. The tree fossils are 160 million years old -it's absolutely unbelievable. That's where a colony of penguins has decided to settle down years ago. We arrive on their nesting site before the sun rises. It's all dark and quiet. We wait, wait until the sunlight appears. That's when the yellow-eyed penguins wake up. Also known as Hoiho, it's the world's rarest species of penguin -there're only 5.000 of them still living. It's a very shy creature, so we have to stay still and quiet, and of course keep our distances. They're just here, playing around, running and jumping in the water. A pretty magical morning in the Catlins! 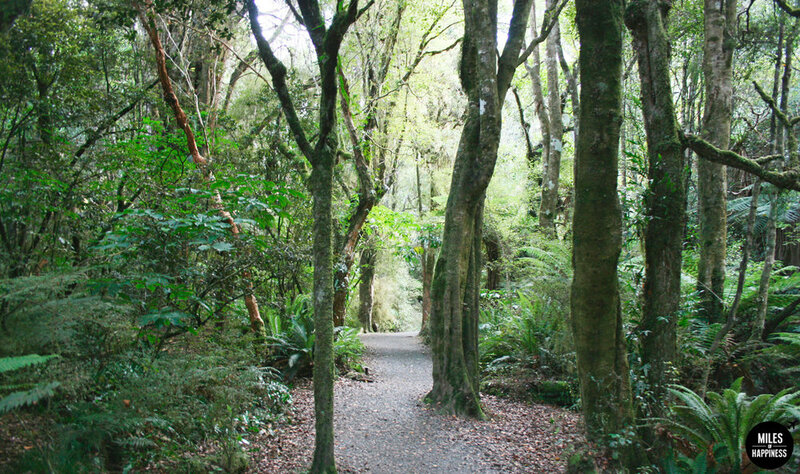 The Purankanui Falls is the opportunity for a beautiful walk in the Catlins Forest Park. One of the most photographed sites in New Zealand, it's a magnificent place -ideal for a picnic or a swim to cool down in summer. Slope Point is known as the South Island's southernmost point. Beyond the steep cliffs, there's only water. Then a few tiny uninhabited island and then... the Antarctica. The strong wind, the silence and the horizon create all together a very unique atmosphere. The views are dramatic. From Slope Point, you can walk around for a little while to enjoy the scenery. The region being consistently lashed with cold winds that blow up from Antarctica, it creates an incredible phenomenon: the trees are twisted and forever bend along the direction the wind blows... even when there's no wind at all! The weather is fierce and the wind relentless... so be equipped in consequence! On Waipati Beach, during low tide only, you can walk through the magnificent 30 meters high Cathedral Caves. Check the tides carefully though, or you might end up stuck in the caves! A splendid show every night. From our picnic spot, we could admire the intense colors of the sun setting on the ocean, while dolphins were playing in the water. One night, we even had the chance to see some penguins walking around at dusk. Prepare some sandwiches and a good bottle of wine, you're in for quite a show. 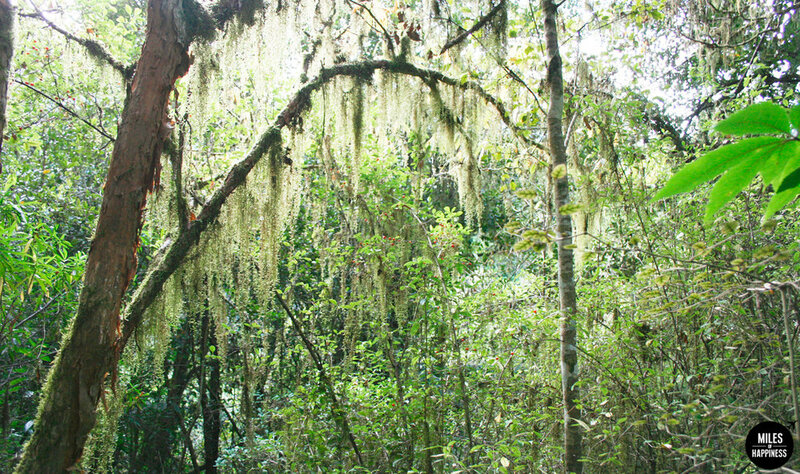 If the Catlins' coast is fantastic to explore, the area also extends inland with some fabulous typical New Zealand tropical bush. Here you can get up close with nature through a range of walk for all levels of fitness. On most of them, you'll be alone. And if you want to get lost for days into the wild, you can always camp under the stars!